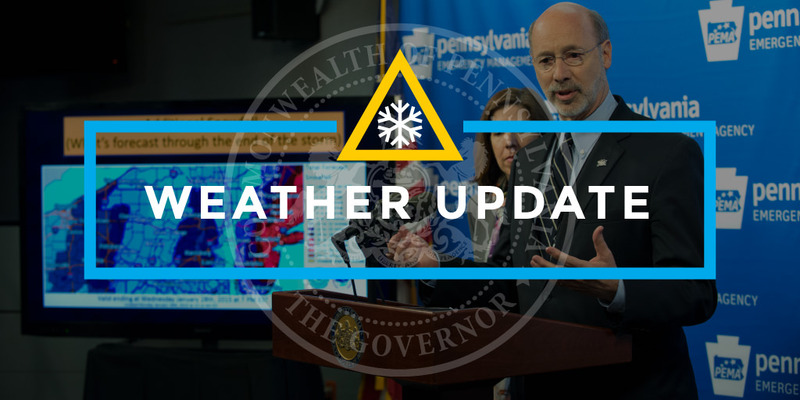 Governor Tom Wolf announced that the Commonwealth Response Coordination Center (CRCC) at the Pennsylvania Emergency Management Agency (PEMA) headquarters in Harrisburg activated at 8:00 AM in response to Winter Storm Harper, expected to affect the state today through Monday. The CRCC coordinates the deployment of state agency resources to counties that do not have the capability to respond as needed or have exhausted all available resources at the county level. PEMA liaison officers are ready to report to county emergency operations centers if needed. Governor Wolf signed a state of emergency declaration yesterday to allow for increased assistance with storm-related needs. The commonwealth also imposed speed restrictions and a ban on all commercial traffic, including buses on most interstates and the Pennsylvania Turnpike from noon today through noon Sunday. Find more information on Winter Storm Harper preparedness and roadway restrictions here.